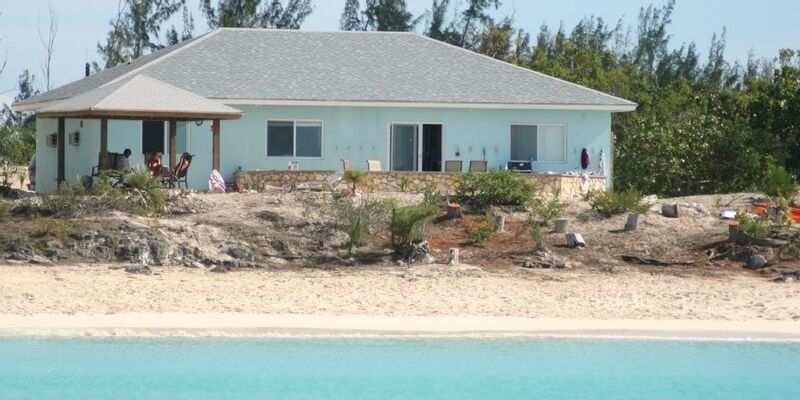 Seabreeze Bahamas is located on the beautiful white sand beach in Bennett's Harbour. One of the only sand beaches on the northern end of Cat Island. With three bedrooms, the house is perfect for a two! The water is calm with a sandy bottom, making it safe for kids of all ages. The 14' gazebo offers shade, while catching the breeze for a nap, or just a few minutes out of the beautiful sunshine. TV, a DVD player, lots of movies, video games, board games, puzzles, books and an iPod stereo system are available to help you relax. There are four sea kayaks and lots of masks and snorkels for you to use. We have a full gourmet kitchen with just about every kitchen gadget you could ask for. There are a few small stores nearby for staples, or 20 minutes North or South to the grocery stores. Cat Island offers many restaurants on the island for a taste of local Bahamian cooking and fresh seafood. Cat Island appeals to those who travel not just to see new landscapes, but also to gain a new perspective on living. You will feel welcomed by the friendly people on this southern Bahamian island. Bonefishing~ Cat Island offers many ideal spots for bonefishing. DIY with our kayaks, or local guides are available to point you in the right direction by boat, or on foot. Anglers can quietly stalk these elusive fish by wading through knee-deep waters of Bennett's Creek. These quicksilver fighters, weighing up to 15 pounds, inspire both fly fishermen and spin casters alike with their power and speed. Unpredictable and wily, the bonefish are often found in schools of 50 or more, making for exciting bursts of action. With Bennett's Creek leading to Alligator point just up the beach, you'll have miles of wadable flats right outside the patio door. Orange Creek offer expansive flats lined with mangroves. There is a tide clock at the house to help you plan your day of angling. Fishing/Snorkeling~ We recommend Ricky Dean for fishing on the sea, or taking your family out to the shallow reef that surround Cat Island on his boat. Scuba Diving~ There are two dive centers on Cat Island. One at Shannas Cove, about 20 minutes North of Seabreeze. The other is down South at Hawk's Nest, about 1 1/2 hours from Seabreeze. First Basin Wall: 100-200ft. Facing the Great Bahamas Bank is a spectacular deep water drop-off. Its proximity to the deep ocean provides many encounters with schooling jacks, Eagle Rays and, occasionally, sharks. Blue Hole: 80-100ft. Out on the bank is a magnificent Blue Hole. Inside the opening divers often encounter schools of fish, large groupers and Caribbean Reef Sharks. White Hole Reef expresses another phenomenon peculiar to The Bahamas: circular depressions in the limestone basin that form flat basins surrounded by coral mounds. These sites serve as an oasis for solitary reef and schooling fish. Exploring the North Shore~ Several roads lead to the North shore where you will find bits of flotsum that have blown in from the Atlantic. Garbage to some, treasure to others and a fun place to see the crashing waves on the beach while searching for seashells. Blue Holes~ There are many lakes and Blue Holes on Cat Island, some are filled with fresh water and some salt. There are many tales of the mermaids who live in them and pirates who disappeared. Bat Caves~ There are at least 18 caves on Cat Island that you can explore. The easiest to find are on the main road about 5 miles south of Seabreeze, or on Dicky road in Orange Creek. Rake n Scrape~ A music festival in Arthur's Town, heald the first weekend in June where famous musicians come from all over the Bahamas to play, and the party goes all night. Regatta~ A sailing race and party that lasts for three days the first weekend in August. Also known as 'homecoming' it's a time when families come back to Cat Island for cook outs and togetherness. Getting There: There are two airports on Cat Island. Arthur's Town (ATC) is only 15 minutes away from our home at Bennett's Harbour, and New Bight (TBI) is about 45 minutes away to the south. Flights are available from Ft. Lauderdale, Florida USA or Nassau / New Providence, Bahamas. Sky Bahamas flys from Nassau to Cat island twice daily. We built our homes ourselves with the help of lots of friends from both Cat Island and Oregon. We think that you'll love our homes as much as we do. We have made every effort to supply you with everything that you need for the best vacation of your life! Please let us know if anything needs our attention. Cat Island is the kind of place that finds it's way into your soul. Most of our guests are planning their next trip back before they even leave. You will think about the tranquil waters for the rest of your a good way. We believe that the cure for anything is tears or the sea. Master Bedroom has a Full Bath. Hall Bath has Tub/Shower Combo. There is an Outside Shower to rinse off after a swim. Sugar sand beach just outside the sliding glass door. Seabreeze is in a natural harbour, so it is safe for swimmers young and old. Year around swimming in the warm waters of the Bahamas. Seabreeze is built right on the white sand beach in Bennett's Harbour, overlooking the tranquil turquoise waters of the sea, with colors beyond your imagination. Keep an eye out for the green flash! 30 steps to the water in white sand. The sea has a sandy bottom. Seabreeze is on the sand. Bennett's Harbour is just up the beach from the small where local fishermen come in with freshly caught fish. Each bedroom has it's own A/C, and there are 6 ceiling fans throughout the home. Both bath towels and beach towels are provided. Full size stove, Microwave hood and a toaster oven. 12 cup Kitchen Aid with timer. Lots of dishes and glassware. Kitchen is very well stocked with everything you need to cook for a crowd, or just the two of you. Full size dining table and 13' eating bar with 6 bar stools. Patio set for outside dining. Lots of books to read. Kayaks, Beach toys and snorkels available. Lots of games for adults and kids. A double and single sea kayak are provided, 2 more are available, ask our on island caretaker. We also now have a paddle Board! Huge 35 x 20 beautiful native stone patio with a breathtaking view and plenty of room to relax. Lots of patio furniture and outdoor speakers makes this the part of the house that you'll spend the most time. Snorkels, water noodles, and beach toys provided. Ceiling fans throughout and A/C in every bedroom. Stereo has iPod hook-up. I have been all over the Bahamas. Seabreeze is by far the best house we have ever stayed in! Communication was great before we arrived. Our every need was met, and the games and puzzles are great for family time. Hours spent on the beach, swimming and snorkeling walking distance from the house. Plenty to do to keep everyone happy. The best thing we did was jumping off the doc, paddle boarding and taking the kayaks up the creek to see the turtles. Best house in the Bahamas! By far the best place you will stay on Cat Island! This house is right ON the beach. The kitchen is huge, with everything you need to cook meals. The beach is stunning, and the gazebo is fantastic for a sunset beverage. We can’t wait to come back! We are so happy when we hear that our guests enjoy our home as much as we do. Cat Island is the perfect retreat from our hectic lives. We look forward to welcoming you back soon! I stayed at Seabreeze house from july4 to july11 in my opinion it was to short! The reason a chose Cat island was because of Bennetts harbor. I'm very picky when it comes to beaches so when I found the perfect house on the perfect beach I fell in love. The house was everything I was looking for, the kitchen is modern and has everythink you need and more, all the bedrooms have air conditioners, a washer and dryer and you even have a gas grill so you can cook your steaks,chicken and hamburgers that you can bring from home in a cooler! Ricky the caretaker came to pick us up at the airport, nice guy. I spoke to him before we got there and he and Debbie the cleaning lady went to the market for us so we could have beer and some things in the house before we got there. Just remember Cat Island is not Nassau so as long as you know that you will enjoy your trip. The internet did not work while we where there Oh Well ;) who cares when you have a beach like that! The weather was hot and sunny every day, I wish I was there now!!! We did not rent a car, Danny king was our taxi driver. The only problem I had was that I forgot to pack my blow dryer( my husband's fault he complain my bag was to heavy) so my hair looked like crap the whole week. If I can make a suggestion will be that the house needs new beach chairs the kayaks where nice to have but maybe one day they can add a standing paddle board? ;) I would like to thank the Romes for sharing there beautiful house with us! I am so happy you had such a great time! We really do try and make every effort for our guests to feel like Cat Island was the best vacation they have ever taken. We have provided just about every kitchen gadget that I can think of, including a 'Margaritaville' blender (bring your own wait staff :) I feel like our house is the perfect blend of comfort and island style. The white/pink sand beach is the best beach I've ever seen. The calm, cool, clear water makes it heaven on earth. The internet should finally be up and running, after literally years of government promises~ YAY!! There is one paddle board, but as it's so portable, we keep it in the garage. Rust is the mortal enemy of beach chairs, but I'll ship a few more down in our next shipment. Thanks for the heads up. We began staying at this house i think in 2009 (see Mermaid in Training review). We have since stayed in some other locales but last year came back to Baybeeeze and this year returned to Seabreeze. In my book its the best of the best. Helpful owner (offsite) and onsite caretakers. I suggest renting the car with the house for exploring. Yardies nearby for conch salads; Da Smoke Pot for lunch or dinner. Check out the Library in Bennetts Harbor as well. Everyone warm and friendly. This house is the perfect base of operations for bonefishing, snorkeling, kayaking, beachcoming and just simply relaxing. We hired Debbie, the housekeeper to take us into the bush and show us local plants used in bush tea and bush medicine. Was a fabulous day. Fun and informative. Also went birding and added many new species! Hard to beat if you are looking for the nice place to stay in paradise. The house is well nice, comfortable, well laid out, and the kitchen is well equipped. Great location right on a beautiful beach. Perfect base to explore the island from or just kick back and relax. If you are on the fence book the place now you will not be sorry. Bennett's Harbour is at the northern end of Cat Island, 15 minutes south of Arthur's Town. The house faces west, right on the sugar sand beach, giving you a spectacular sunset every night and a chance to see the green flash. Seabreeze on the calm and protected leeward side of the island, and is in a picturesque natural harbour. There is no coral on the beach, only soft pink/white sand on a secluded beach making it safe for all ages. Other Activities: Relaxing on the beach, lounging in a hammock on the gazebo, bonefishing, paddling the creek in sea kayaks, exploring bat caves, hiking to the Blue hole at Orange Creek and exploring the untamed northshore. Be sure to bring your iPod and kindle and plan to RELAX! If all else fails fire up the Margaritaville Frozen Concoction machine and enjoy the sunset from the 35' native stone patio. $ 1,900.00/week first 2 people, $ 175/week for each additional guest ($ 25/night). 2000 Ford Expedition is available for an additional $ 550./week.